This is a rough guide to how I do things, on a monthly basis. It has worked for me over the years, but I am always looking to improve where I can. 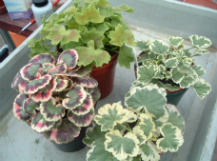 All the plants which were used earlier in June for shows, should all by now be cut back and showing signs of new growth. 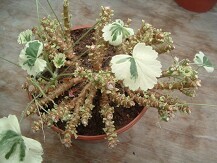 In the photo you will see a plant of Madame Salleron, which was cut back hard after the PAGS National Show (20 days ago). I cut back quite hard on some plants as you can see. This way you will not get much old wood, and a nice compact plant. Angels are an exception, I only go back by half at first, then wait until they start to shoot lower down the stems. Once this happens I cut back further, always just above a leaf node. I found that any cuts made in between leaf nodes, cause the stem to die back, and can even make the whole stem die right back to the base of the plant. Feeding with Chempak No. 2 high nitrogen for a few times helps give the plants a kick. I always cut my Miniature Stellars back this time of the year, as some of them can be temperamental. Scottow Sparkler is a prime example of this, as I have found if I cut it back after the end of August it will just die on me. The one of the left is the Scottow Sparkler I got Best in Show with at the Yorkshire Society, the one on the right was at the PAGS Show. You will note that some old leaves are left on the plant (I have mentioned this on the Growing Tips page). 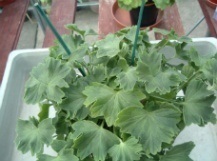 This helps to bring the plant back quicker and better, than if the plant is stripped bare. 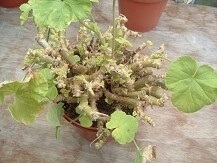 A plant of South African Sun, which was cut back 20 days ago, this shows how quickly the growth comes back this time of the year, compared to the cooler weather in the autumn. 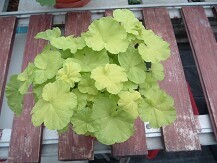 To start this month I have taken a photo of Madame Salleron, to show the plants progress since July. My main job this month is to cut back after shows, remove any dead leaves, and cut out any dead branches. 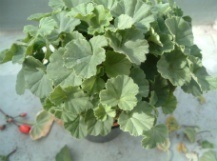 Some of the plants I will cut back even further, like Oliver Welfare in the photo, this will help shape the plant. I also remove any big leaves to let more light into the lower leaf joints, as I want as much growth as possible at this stage. You can see the end result in this next photo, no need to worry about the gaps in the foliage, as there will soon be plenty of new growth to fill them. I have used this photo of a 16 month old Regal cut back at the end of June, to highlight how hard I cut some of them back. 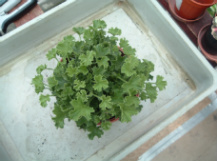 The marker pen is resting on the rim of the pot, as you can see the plant has come back well and will soon need its first stop. 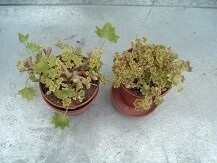 My first job this month is to stop all my young plants, like the ones in the photos. The first one is of Imperial Butterfly, taken after its fourth stop. This needs to be at 2 or 3 sets of leaves, otherwise it will soon grow away from you and become leggy. 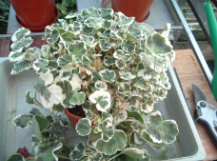 The one plant that I do not stop is Excalibur, it has a strange effect and seems to stunt the plant. 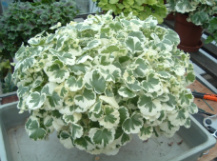 Given plenty of light, it makes a nice compact plant, without the need for stopping. The weather has started to cool down this month, so I have increased the feed to half strength (No. 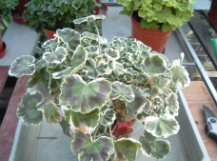 3), as the plants do not need watering so often. Do not be afraid to stake plants even at this early stage to train to shape, as I have done to this Miniature Zonal and Stellar in the photos. The weather has cooled down now, so I have removed the white shading from all the greenhouse windows. It was washed off with water and a brush, this leaves the glass nice and clean for when the insulation does in at a later date. I will make a start on giving all the plants that I cut back after the shows some fresh compost to keep them growing through the winter months. 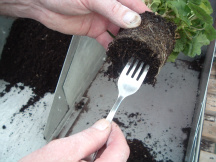 I do this by removing old compost from the bottom of the rootball with a bent fork as in the photo. 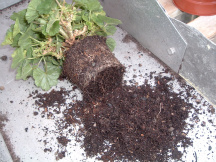 Any loose compost is removed from the top. Fresh compost is placed in the bottom of a pot, the plant is then put back in and care is taken to make sure it has been lowered so no old wood can be seen. 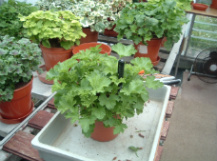 Then fill right to the top of the pot with fresh compost and firm down. 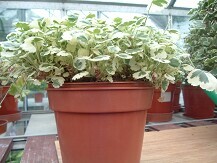 NB I only do this to plants that have reached their final pot size.